Over the next couple of months I have a few exciting projects coming up. I am have the final courses and concerts with both my county youth orchestra (CCVGYO), and the National Youth Orchestra of Wales, which have been a part of my life for seven years! The CCVGYO concert is at Hoddinott Hall on July 18th, and the NYOW concerts are listed here. Keep an eye on my events page for all of these and more! What I wanted to talk about is the upcoming Trinity Laban opera (A Midsummer Night’s Dream by Britten). We started rehearsals on Monday and have our first run through with the singers this evening. I played this 5 years ago at the Edinburgh Fringe and I’m really excited to revisit this piece as it holds some amazing memories for me. I’m looking forward to working with the singers tonight as I think the production will really start to take shape, and I can’t wait to see the set! Another reason I’m excited to be in this production is that one of my best friends has a lead role (she’s playing Helena) and we finally get to be in a project together. With her being a singer, and me a violinist we rarely get put in college projects together, so this is particularly exciting! The performances are at Blackheath Halls from 1st– 4th July so if you’re around the area I’d check it out. It’s going to be an amazing production. Grace Notes: What next?… and some very exciting news! So now my exam is over, I’ve been enjoying relaxing and having the time to go and watch some of my friends play in their final exams. Yesterday were the trombones, and today I saw my fellow violinist Horizon String Quartet and a fabulous percussion final. It’s been great to see the performances and celebrate their achievements with them. Also, some very exciting (and completely non-musical) news has come out today. 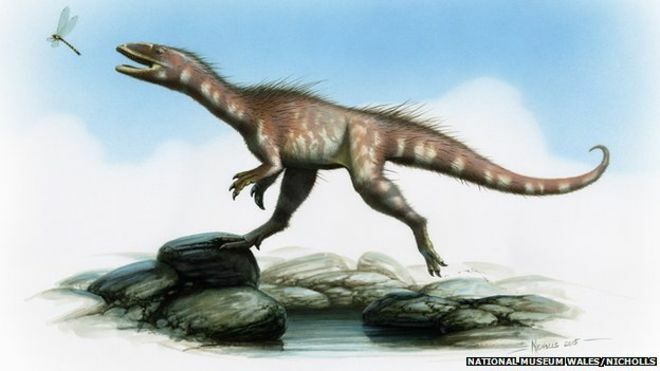 In Penarth in Wales, a new species of dinosaur has been discovered by Nick and Rob Hanigan. My Mum is a Palaeontologist at the National Museum of Wales and she has been helping to put together the exhibition around the new fossil which the brothers are donating to them. I’m really excited to go and visit this exhibition on Friday (when I go back to Cardiff for the weekend) and it’s amazing that this sort of discovery has been made so close to home. Through my Mum’s job, and my brothers obsession with dinosaurs from a very young age (I have seen ‘Walking With Dinosaurs’ an infinite number of times! ), I have grown up surrounded by them (just facts I hasten to add, our house isn’t something like Jurassic park) and so now love them too (just ask any of my friends, they think I’m obsessed. My next sewing project is dinosaur themed as well…). So if you happen to be in Cardiff between now and September, you should check out the National Museum of Wales in the centre of Cardiff. Not only has it got amazing natural history and art exhibitions, but you can experience this brand new discovery for yourself! Last Thursday (I’m sure I’ve mentioned this a few times) I had my end of year exam. I’ve mentioned here that one of my big struggles this year has been with performance anxiety. I’ve been trying a few techniques to combat this and I really think they’ve worked! I managed to get through my exam without falling apart, forgetting my piece and letting every mistake get the better of me. Here is what helped me through. 1) Memorising. I knew my piece back to front, inside out and upside down. I was practicing from memory for a couple of months without using the music and so was used to not staring at the dots the whole time. This allowed me to be completely immersed in the piece and distance myself from the fact it was an exam (I also played with my eyes closed which really helped! Even though I may have looked a little silly…). 2) Visualisation. Every night before I went to sleep I ran my piece in my head. I imagined I was in my exam room and playing with my accompanist and tried to feel the ‘nerves’ of the performance. This is also a great technique to help you sleep… I definitely didn’t make it to the end of the piece every night! I got this technique from a great YouTube channel called Clarinet Mentors, which have a few videos on how to manage performance anxiety which apply to all instruments, not just clarinets. 3) Listening. In the weeks leading up to my exam, I recorded myself playing the whole piece through every couple of days. This meant that I could listen back to it and hear for myself the good bits, and the bits I needed to work on. I could also listen to one from a few days before and hear the improvement, which is a great confidence boost! Maybe if you’re struggling with nerves, or are stuck in a rut with learning your piece, these three techniques might help! Also, apologies for being late on this post. I had a mini-holiday in Prague (we got back at 4am this morning), and that was the perfect post-exam treat! I’m totally relaxed now and ready to start up again with practice, lessons and learning my part for the college opera, ‘A Midsummer Nights Dream‘.